Angry Driver Knocks Over Disabled Man In Scooter! Shocking Footage! When a man in a scooter found himself stuck behind a woman’s truck, he told the woman to ‘calm down.’ Unfortunately, the truck driver lost her cool and started to have a seriously intense temper tantrum! Running out of the truck, the woman screamed at the man’s face! She ordered him to move. The man again told her to ‘calm down.’ As she screamed she was ‘calm’ at the man she pushed him over, knocking him out of his scooter. The man immediately calls for help, as the woman tries to drive away. 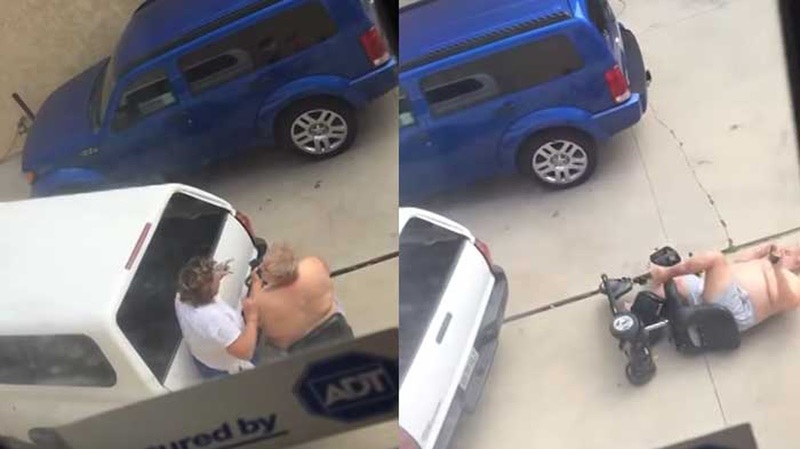 She almost crushes the poor guy’s scooter, too! What did you think of this really intense road rage incident? Let us know in the comments below and SHARE this post with your Facebook friends!